Here's the first unexpected reveal of the Detroit Auto Show — Toyota's let loose the new 2010 Toyota Camry and 2010 Toyota Camry Hybrid. They'll both go on sale beginning in March. DETROIT, January 11, 2009 - - The 2010 Camry is on display for the first time today at the North American International Auto Show (NAIAS). As the best-selling passenger car in America for seven years running and 11 of the past 12 years, Camry continues to redefine standards for comfort and performance. The 2010 Camry and Camry Hybrid scheduled to go on sale in March, have an array of enhancements, inside and out, including exterior styling, performance, safety, audio and convenience features. Camry also has an upgraded standard powertrain for 2010. A new 2.5-liter four-cylinder engine equipped with variable valve timing with intelligence (VVT-i) will produce 169 hp for Camry, LE and XLE grades. For sporty performance, SE grade get additional tuning and gets 179 horsepower, 21 more horsepower than the previous four-cylinder engine. The new engine can be combined with a six-speed manual transmission or a six-speed automatic transmission with sequential shift. A powerful 3.5-liter V6 delivering 268 horsepower is also available. Exterior changes to the gas model Camry include a newly designed grille and front bumper, an enlarged lower intake, larger projector headlamps and restyled tail lamps. The Camry and LE grades feature restyled standard wheel covers. The XLE grade will run on new 16-inch 10-spoke alloy wheels, while the SE grade adds new 17-inch sporty alloy wheels. The Camry Hybrid exterior enhancements will include a unique hybrid grille, a distinct front bumper, a wider lower intake, restyled fog lights and 16-inch alloy wheels. The Camry Hybrid, equipped with Toyota's industry-leading Hybrid Synergy Drive, certified as an Advanced Technology Partial Zero Emissions Vehicle (AT-PZEV) is just one of a handful of cars that meets this strict standard, producing over 70 percent less smog-forming emissions than the average new car. Inside, Camry and LE grades are available with an optional audio system equipped with a new USB port for auxiliary music sources, Bluetooth®, integrated satellite radio, single-CD, and MP3 and streaming music capability. Previously an option, all Camry gas models will now be equipped with Vehicle Stability Control with traction control. Auto up/down power windows with jam protection on all four doors is standard equipment. Camry Hybrid adds a newly designed meter cluster and Fraichir, a combination of silk protein and synthetic fiber, cloth seating surfaces that are gentle to the skin. 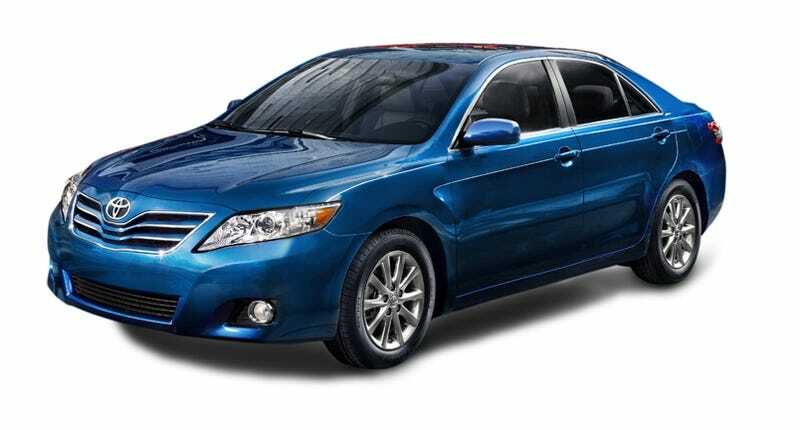 Pricing for the 2010 Camry will be announced shortly before it goes on sale this March.